On behalf of Christ the King School we welcome you and your child. The major goal of our program is to provide your child with educational opportunities that will enable him or her to grow intellectually, socially, emotionally, physically and most importantly, spiritually. We will work hard to serve this goal. We wish for you and your child a year to remember - full of learning, acceptance, growth, and meaningful experiences. We need your help and support, and invite you to participate with us in providing a worthwhile educational program for your child. KINDERGARTEN: Children will be required to wear the school uniform as specified in the Christ the King School Policy Manual. All clothing that could be removed - such as raincoats, sweaters, sweatshirts and jackets must be labeled with the child’s name. PRE-K: A Pre-K tee shirt and sweatshirt may be worn with navy blue shorts or slacks. Girls may also wear navy blue skorts. All clothing that could be removed - such as raincoats, sweaters, sweatshirts and jackets must be labeled with the child’s name. Tennis shoes are preferred. Slip-on shoes, sandals, boots and Crocs may not be worn. Please sent an extra change of uniform clothes to be kept in backpacks. KINDERGARTEN: A supply list will be distributed in June. Kindergarten supplies will be for community use. PRE-K: A supply fee will be billed from your account. This will cover the cost of pencils, crayons, glue, watercolors, paints, scissors, paper, a cot, cot sheet and snacks. You will be asked to provide a large towel to be used as a blanket, a backpack and a lunch box for your child. From time to time we ask children to bring educational materials to share in class. We urge you to guide your child into bringing only those things that will be worthwhile to the entire group. We discourage bringing toys and playthings to class. There will be days when they will be allowed to bring a special toy such as a Christmas toy after the holidays. Notes will be sent home regarding these days. KINDERGARTEN: School Hours: 7:45-2:30. Children may begin arriving at 7:30 a.m. The doors will be locked at 7:45 a.m. Any child delivered to the school after 7:45 a.m. must be escorted to the main school office where they will receive a tardy pass before going to class. School will dismiss at 2:30 p.m. Students not picked up by 2:45 p.m. will be sent to After School Care. PRE-K: School Hours: 7:50-2:30. Children may begin arriving at 7:30 a.m. Any child delivered after 7:50 a.m. must be escorted into the Pre-K office to be checked in. If your child is absent or is going to be late, please call the Pre-K office at 225-7883 ex.256 before 8:00 a.m. to inform us. Pre-K will dismiss at 2:30 p.m. Students not picked up by 2:45 p.m. will be sent to After School Care. If appointments must be made during the school day, we encourage that these appointments be after 1:00 p.m.
Children will not be allowed to go home with other children or a relative unless a written note is sent to school that morning. KINDERGARTEN: When dropping off in the morning, please wait to see that your children have entered the building before you drive away. PRE-K: Children will be met at their cars and directed into the building. Teachers will be in the halls to greet them and help get the day started. We will be using a numbering system for picking children up. Every carpool will be assigned a number and given numbered cards. Each car will need to keep the numbered card in the front passenger window. If you have more than two drivers you will need to make additional numbered cards. The children will be called by carpool numbers as their cars arrive at dismissal time. Remain in your car as you drive through the line. Your cooperation in this procedure will insure the safe and expedient dismissal of the children. DRIVERS ARE NOT ALLOWED TO USE CELL PHONES WITHIN SCHOOL ZONES. Arkansas law requires all children under 6 years of age and/or weighing less than 60 pounds be restrained in a properly fitted child safety seat. If your child is riding home with another person please make sure you have made provisions for him/her to have a safety seat. Each child in kindergarten must present his or her immunization record at pre-registration. Childhood diseases are very communicable. When your child shows an indication of illness, please do not send him to school. Before your child returns to school, he/she must be free of fever, vomiting and diarrhea for 24 hours. If your child is too sick to play outside, he should be kept at home. Please do not request that your child stay inside except in unusual circumstances, as we are not always able to provide ample supervision to the children left in the building during recess time. Your child’s teacher will exercise reasonable judgment concerning weather. Children need to dress appropriately for outdoor play in all seasons. This includes mittens and hats in wintertime, as we will play outside unless the temperature is below freezing. The children will be provided a nutritious snack every morning. However, on a child’s birthday he may furnish refreshments if he wishes. These will be served at snack time. If you plan to celebrate a birthday at school, please make arrangements with the teacher in advance. Children with summer birthdays will have a time to celebrate their “un-birthday”. If you send invitations to a birthday party we may distribute them in class only if EVERY child is invited. Balloons are not allowed in the facility. Children may bring lunch from home or may purchase lunch and/or a drink at school. Children who arrive late must bring a lunch from home or call the office at 225-7883 before 8:30 a.m. to order a lunch. Food brought from home cannot be microwaved. PRE-K: Lunches prepared at home should meet guidelines set by DHS, therefore, fast food lunches are not allowed. Conferences will be planned with parents at least twice during the year. Generally the first conference will be scheduled at the end of the first nine-week quarter and the last one will be scheduled the third quarter. However, additional conferences may be scheduled throughout the year if necessary. We will make every effort to arrange a conference time convenient for you. Report cards will be sent home on nine-week intervals. The first nine weeks will be spent getting to know your child’s strength and weakness, so no written report will be sent home at that time. 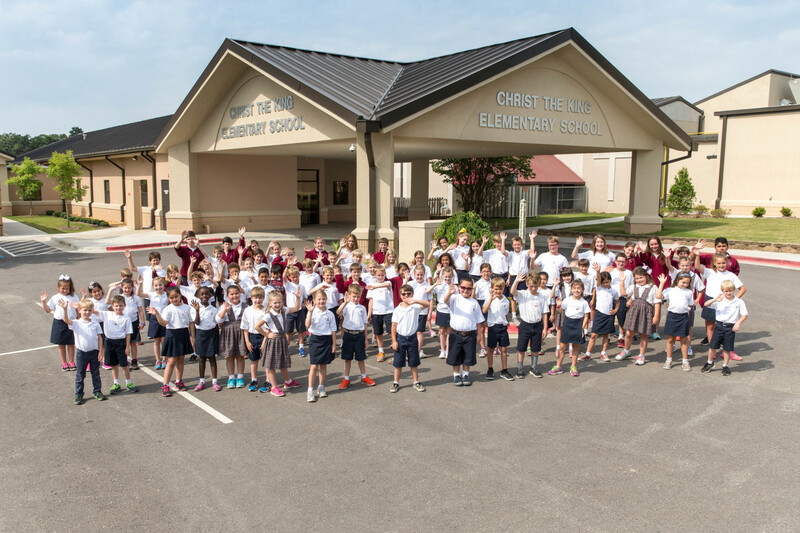 (PRE-K ONLY): Christ the King Pre-Kindergarten is licensed by the Arkansas Department of Human Services. In accordance with DHS policies, children are required to have at least one hour of rest time each day. Pre-K children rest on cots and sheets provided by the program. Sheets will be sent home for laundering and must be returned promptly. You may send a beach towel for your child's comfort. There will be several parties throughout the year. The teachers will plan these parties and may ask for your help by sending supplies. You will have an opportunity to sign up to help in your child's classroom. PTO helpers, homeroom parents and copy helpers will also be needed. All volunteers must read the Diocese of Little Rock Policy Statement on The Sexual Abuse of Minors and sign forms stating they have read these policies. All classroom helpers must also complete the Safe Environment Program. (PRE-K ONLY) A behavioral guidance policy will be distributed to each family. This document must be signed and kept in your child's files at school. The Pre-Kindergarten rules are included in this handbook. If a continued pattern of disruptive behavior that may be harmful to other children occurs a child may be asked to leave the program. Please know that every effort of remediation will be used before this happens and parents will always be informed of behavior that cannot be controlled in school. All teachers and staff of Chris the King Pre-Kindergarten are mandated by law to report any child abuse and/or maltreatment. If you suspect any maltreatment or abuse on the premises please call the Child Abuse Hotline number at 1-800-482-5964 or 501-682-8590.